I’m a (happy!) owner of a Casio EX-WORD Dataplus 5 XD-A4700, a Japanese electronic dictionary. Recently I looked into updating the Japanese-English dictionary (currently the Shogakukan PROGRESSIVE dictionary) installed, because it’s not good enough: too often when looking up odd sentences (like the ones in Fate/Extra CCC) I do not find any matches. EDICT is adequate, and while I can use it on my phone and tablet, I like the fact that the EX-WORD has a physical keyboard along with the stylus, and a very nice kanji handwriting recognition. After a bit of looking, I found the 5th Edition of the New Kenkyusha dictionary, offered as microSD card, to be what I needed (but a bit pricey, 10,500 yen on Amazon, and that’s heavily discounted!). There’s of course one little problem. Although these products have accompanying software, it is in Windows format only.And I’m using Linux. Of course I could just plug in the microSD, but what if I wanted to to move the dictionaries to the main internal memory? What to do? Although there’s an USB port, the EX-WORD does not operate like a USB mass storage device: communicaation is done through OBEX and specific commands to load, view and install dictionaries (along with listing, download and upload files to the SD card and the internal memory). Looking through the Internet led me to the libexword project, a library which provides a way to access these electronic dictionaries and a command-line application, and this post deals on how I made it work for me (but notice, it may not work for you). Then we need to switch branches, because most of the ongoing work is not in the master branch, but instead in the 2.0-dev branch. If you don’t specify a prefix, the library and the application will be installed to /usr/local. autogen.sh may complain about a missing AM_PROG_AR (it did on my openSUSE system), so edit configure.ac and add AM_PROG_AR around line 15, then rerun autogen.sh. Or become root and issue make install (assuming you’re installing to a system prefix). “connect” takes different options: check with “help connect” for what you need specifically. Notice however that some directories can’t be accessed. There are also other commands: use “help” to see them all. Issue “disconnect” when you are done, and “exit” to exit the program. There’s also a Python binding made using SWIG: I’ve yet to play with it. 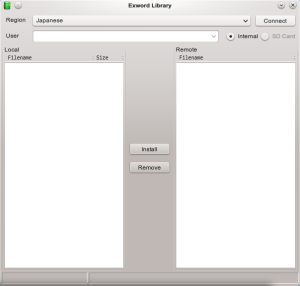 The libexword developer has also created some GUI tools to mimic the Windows EX-WORD tools (which, it must be noted, work only with the Japanese dictionaries). You can get them at the exword-tools git repo. The procedure for installing them is the same as above (including the modification to configure.ac). You’ll need the development headers of wxWidgets, however, as this is a GUI application. 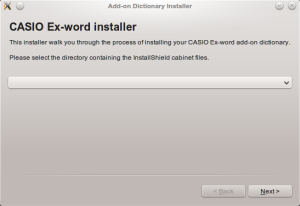 After installing, you can launch ExwordLibrary, ExwordTextLoader and ExwordLibraryInstaller. 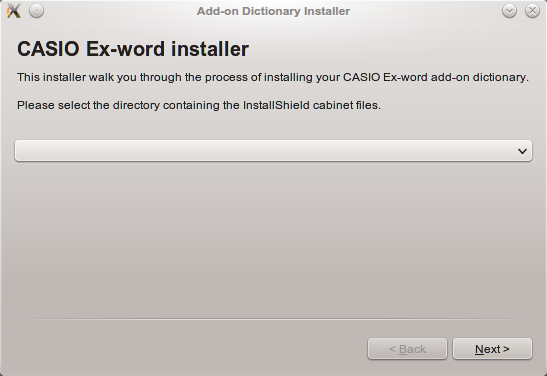 The latter is required to install new dictionaries, and unfortunately involves getting a Windows executable and placing it under PREFIX/share/exword, where PREFIX is the path you gave to the libexword configure script. This also means you need wine to run it. And that’s all. I hope this has been useful for using your electronic dictionary with Linux!